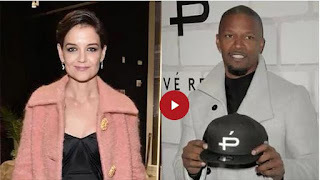 Jamie Foxx and Katie Holmes have been dating for around six years — or, in celebrity terms, a century — but we can count the number of times we’ve seen them together in public on two hands. They’re notoriously private — up until last year, spotting Jamie and Katie in the wild was about as unlikely as finding a Kardashian in a Taylor Swift music video. They’ve loosened their media chokehold a bit, and were even seated (*gasp*) together at an event in early 2018, but they still kept their distance, seemingly attempting to limit the paparazzi opps by restricting date nights to Southern locales like Atlanta and New Orleans. When they did step out together in a paparazzi hot-spot like N.Y.C. or L.A., they made sure to avoid to arriving together. But on Wednesday, after weeks of breakup rumors, Katie and Jamie were spotted (in N.Y.C.! Together! Wearing oversized sunglasses! And hats!). Holmes went for double-denim in her go-to chambray trench, light-wash capri jeans, and Alexander McQueen sneakers ($530; mytheresa.com), which she accessorized with a cozy wool hat, classic shades, and a red Chanel purse. By her side stood Foxx in a sophisticated navy coat, matching trousers, black sneakers, a knit beanie, and some Privé Revaux sunglasses. If this uncharacteristically public appearance (they were walking along Central Park, for crying out loud!) doesn’t end breakup rumors, we don’t know what possibly could.